The transactive electricity market must address many emerging challenges that occur as consumers actively participate in trading electricity. Electricity pricing is crucial. Efficient electricity pricing schemes must bring proper incentives to the customers and are crucial in transforming the grid. On the other hand, poor pricing can provide harmful incentives to the customers which leads to new issues. Implementing the transactive electricity market requires integration of utility’s operation, customer behaviors, physical grid constraints which is a huge challenge. The main focus of this project is to build an architecture to facilitate participation of consumers in electricity market to capture the reaction of customers to real-time rates and the effects of those reactions of the system to ensure that the physical constraints in the system is not violated. The proposed HMAS architecture will monitor the system consisting of utility, homeowners, cyber system and physical system at each level from the homes all the way to utility, taking corrective actions as required. This project uses a four layer Holonic Multi-Agent System Architecture to integrate the cyber and physical aspects of the smart electrical distribution system that considers the active role of electricity consumers. Future power distribution systems will include a high renewable energy penetration along with energy storage devices and smart metering and advanced control devices. The goal of this project is to produce a general and extensible cyber architecture based on holonic multi-agent principles that provides a path way to the emerging area of transactive energy market in power distribution systems, an to provide s foundation for other engineered systems with active consumers, such as smart cities. 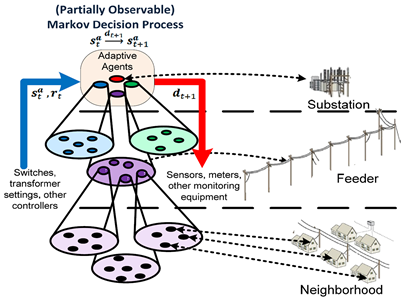 It will produce new analytical insights into generalized stochastic modeling of consumer responses to real-time pricing of electricity and the impact of such active consumers on grid reliability. Finally it will develop a novel methodology for comprehensive distributed control and management of power distribution systems for higher efficiency with active consumers and high penetration of distributed renewable resources. Completion of this project will result in modeling, control and simulation architecture for active consumer driven CPS domains. The resulting gains in operating, efficiency, economics, reliability and security will result in overall welfare of the society. This project is being funded by NSF from October 2015 to September 2019. The complex nature of future power distribution systems will require them to adapt reactively and proactively to normal and anomalous modes of operation within a very short time period. The architecture produced by this project will be capable of optimizing performance and maintaining the system within operating limits during normal and minor events, such as cloud cover that reduces the output from solar panels. The architecture will also allow the operation of a distribution system as an island in emergencies, such as hurricanes/earthquakes, grid failures, or terrorist acts. The project will inspire future engineers by producing a simulation to allow students to interject faults, failures, or weather events to see how an intelligent power distribution system will respond. This project was funded by NSF from September 2011 to August 2015.